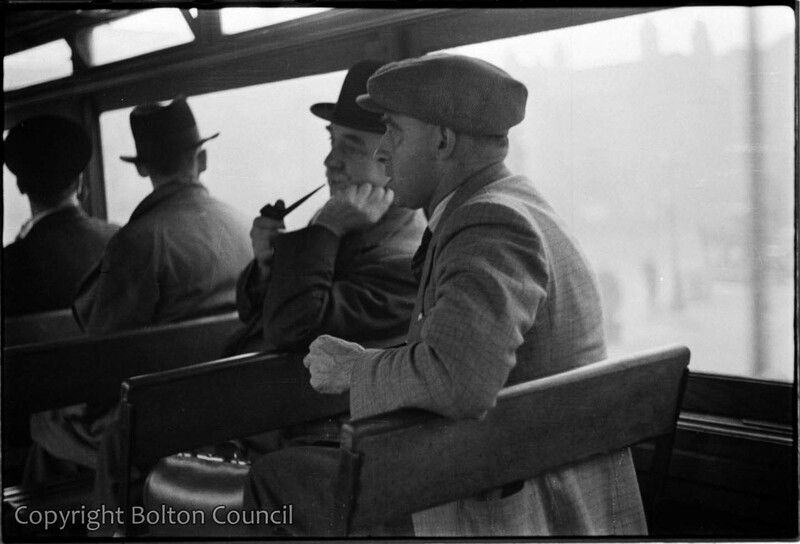 Two men smoke on the top deck of a tram. This photograph shows how Mass Observers found out information by listening and recording overheard conversations. On a sunday morning my mother used to give my brother Roland and I,sixpence to get a tram to Horwich and back,While she baked.We would catch it on Chorley New Rd, At the entrance to the B.R.Infirmary.We would let every tram go by until an open fronted one stopped We went upstairs to the front where we had access to the handle that turned the destination roll. there was also a metal stancion with a push bell on it. Naturally we never stopped dinging the bell and altering the destination. When the tram arrived in Horwich The cunductor swung the electric contacts facing the opposite way with a long pole.Allthe wooden seat backs swung over so you were facing the way you were travelling. I used to look forward to sunday Mornings.